This is really just a comparison of Chrome and FFox. Opera is essentially Chrome and IE is discarded outright. 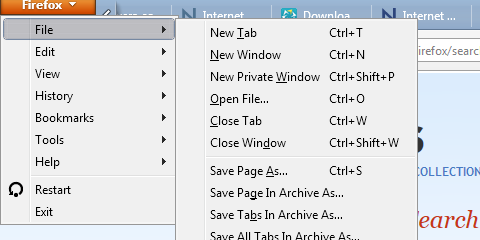 Mentions iMacros in a way that implies it's only available for FFox, where in fact it can be used on Chrome and IE as well. It's a very good automation tool. I think this format would have been better suited in a video where he could have shown some of the usability things he likes in FFox vs. those he dislikes in Chrome. Anyway, interesting stuff. Edit: The article mentions the Update Scanner add-on, which I didn't know about and looks really sharp. webfork wrote: Edit: The article mentions the Update Scanner add-on, which I didn't know about and looks really sharp. I use the portableapps version and it creates Mozilla folders both at Local and Roaming folder of AppData. So, how can it be stealth as mentioned in the main database entry? ripu wrote: I use the portableapps version and it creates Mozilla folders both at Local and Roaming folder of AppData. So, how can it be stealth as mentioned in the main database entry? Because it cleans them both up on exit. If that's not the case for your specific setup, please post a detailed bug report in the PortableApps.com forums (including full install path, Windows version, any FirefoxPortable.ini modifications, anything left behind on exit, etc) and we'll figure out what's going on. Now, we have an official release for 64 bits version. Do you think there is some possibilities to obtain in a short delay, a portable 64bits version ? According to the release announcement, Firefox Portable 43.0 already works in 64-bit mode on 64-bit Windows. This release updates to the latest version and introduces automatic dual-mode 32-bit and 64-bit operation, ensuring Firefox runs as fast as possible on every PC. Also since Firefox v43 has a 64-bit build, those using PortableApps.com's version might want to use the 32-bit version instead. For my usage, I have 94 tabs open (don't ask). With 32-bit, RAM is 641MB. With 64-bit, it was ~200MB more. freakazoid wrote: For my usage, I have 94 tabs open (don't ask). With 32-bit, RAM is 641MB. With 64-bit, it was ~200MB more. Yeah that'll happen. I'll likely use that to stick with 32-bit for compatibility reasons. The only reason I see at this stage to switch to 64-bit at this stage is a possible security improvement. I can't seem to track down any clear data on 64-bit browser benchmarks doing much more than improving tech already built specifically for 64-bit. Another example of 64-bit preventing memory leak crashes is the game planetside 2. Used to be 32-bit only and memory leaks would cause majority of the crashes to the game. Now that it's 64-bit only, It would still sometimes hog a bunch of memory but now doesn't crash when it goes over 3GB. Nice to know that, Userfriendly, thanks for the info. I fashioned it like this after some research, ever since FF took the "fast development" schedule, wreaking havoc with my previous setup. To do it, I had to use two different FF extensions: Personal Menu (http://addons.mozilla.org/en-US/firefox ... onal-menu/), which allows you to restore the FF button and place it wherever you like best (top left corner, for me), and Mozilla's very own Menu Editor (http://menueditor.mozdev.org/; although not having been updated since 2011, it always worked perfectly for my intents) to choose and order the main entries and remove the remaining fluff. "Menu Editor could not be verified for use in Firefox and has been disabled". Luckily, ATM everything else is working as it should. But soon enough I'll be faced with having to reconfigure FF and then I'll be yet another usability feature short again. Add in about:config "xpinstall.signatures.required" Boolean "false" to allow unsigned extensions. Alternatively, copy paste this into pref.js "user_pref("xpinstall.signatures.required", false);"
[url]http://www.m64.info/[/url] author wrote: Download and Help: 64-bit Firefox, Thunderbird and Seamonkey. More than that, they also have benchmarks of 64-bits versus 32, links to Firefox alternatives, including portable, etc. From v45 on, Firefox now has its own CLI (command line interface). To try it, press 'SHIFT+F2' (and 'help+ENTER' for the commands list). Last edited by Midas on Fri Jun 10, 2016 10:23 am, edited 1 time in total. This is somewhat old news now but evidently Iceweasel (a rebrand of Mozilla for Linux) has been dropped. I'm very glad to see this, if only because it was confusing and annoying "the license made me do it" tweak that never seemed substantive to me and just confused people outside the open source / Free Software community. It's not hurting LibreOffice adoption when people find out that it comes with virtually every Linux distro so I'd feel similarly confident if I could say something similar of Firefox. Before you say "but how many Linux users are browsing with Google Chrome?" the answer is unclear (I couldn't find anything on distrowatch) but this might be instructive.